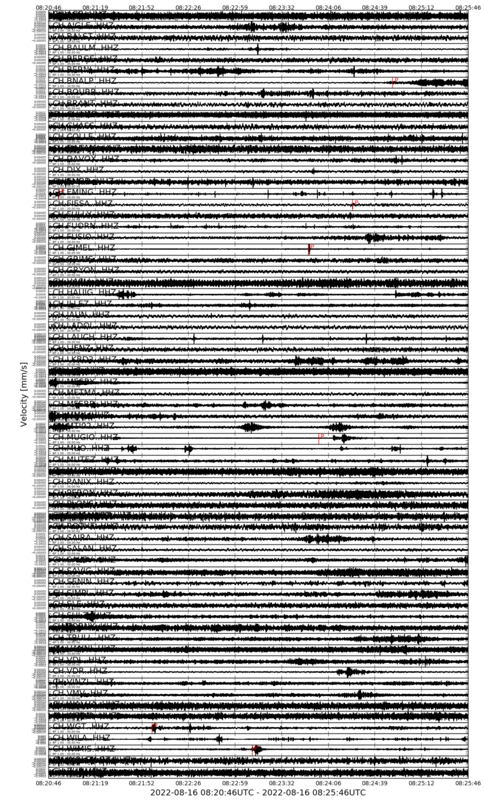 This image shows the last 5 minutes of waveforms recorded across Switzerland. Shown are the highest sample rate vertical component from all the broadband stations (HHZ) operated by the CHNet. Stations are sorted in alphabetical order. The instrument response is first de-convolved, then band-passed between 1 s and 30 Hz. The units are bandpassed ground velocity, mm/s. Automatic high frequency detections (local Bear picks) which are used by the Seismic Network to identify earthquakes are included in red. The image is updated every 60 s. This view can be used to observe seismic signals immediately after an earthquake has occurred. Note typically events are not identified and included on our website until 1-2minutes after earthquake occurrence.